An unlikely source is emerging as a trendsetter for work- place design. With building interiors long considered ugly ducklings for their mundane looks, one of the nation’s largest commercial real estate owners is raising the bar for requirements in performance standards and style. 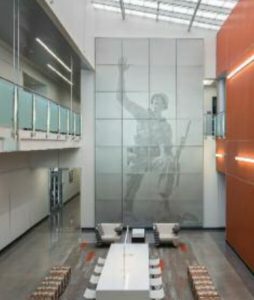 Senger Design Group specified Shaw’s Absorbed tile, Visible tile and Colour Plank tile in its redesign of the Colorado Army National Guard Readiness Center. 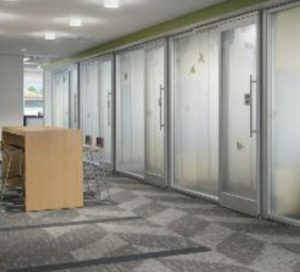 “GSA has really been a leader in new workplace design, from the standpoint that we were among the first people to say the way to do the best workplace design is understanding the workspace around it,’” said Kevin Kampschroer, chief sustainability officer at the U.S. General Services Administration (GSA). “The real strong value to government and any organization is to have people work together from time to time; that’s how you build cohesion. 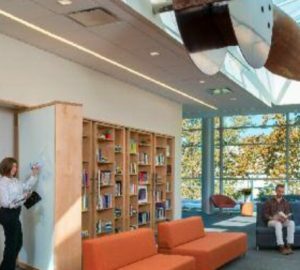 So the workplace isn’t looking for the same type of utilitarian needs as 40 years ago.” The agency manages architects and engineers to provide design for federal clients needing new workspaces. The federal government is reportedly creating 21st century style workplaces to drive down cost, increase productivity and green office space. Within the past two years, GSA revised its facility standards and set requirements for new or renovated buildings, moving to a performance-based approach. The end result is federal projects are breaking away from institutional-type looks and creating workspaces which more closely resemble corporate offices. The Federal government reportedly owns and leases nearly 10,000 properties, although only a percentage of them under go remodeling or new construction work during the year. While these projects are not necessarily increasing budgets to accommodate more expensive interior decorating products, designers are making smarter choices. For example, “We are building LEED Silver and Gold buildings at the exact same price as the buildings before,” Kampschroer said. “This was the result of [allowing] design teams to use their creativity and imagination, and for GSA project teams to be open minded to new solutions.” LEED-certified Federal buildings include approximately 130 owned by GSA and another 400 leased facilities. Interface’s Accent Flannel is featured in the NASA IESB, a LEED-NC gold-certified facility. One key factor driving change is lead time from when new construction or renovation projects appear on the books until they are shovel ready. In the past it was not uncommon for years to go by before the work was started, so interior design plans became antiquated. “We have told design teams, ‘If you can do a better design that achieves a higher level of performance, sustainability and show ideas, we will look at it with an open mind,’” Kampschroer said. GSA has led the workplace transformation by renovating its own headquarters in Washington, D.C. Workspaces utilize multi- ple soft and hard surfaces which meet performance, sustainability and aesthetic objectives. “When you walk around our new headquarters, I can show you dozens of ideas that 20 years ago would not have occurred to people, even after Design Excellence, or 10 years ago after adopting sustainability into building design,” Kampschroer said. There are a myriad of laws and regulatory acts at the federal level that require sustainable design in commercial applications. One of the most significant changes in floor covering for GSA projects is the advent of environmental standards. The objectives defined in Executive Order 13693 from last year require reductions in greenhouse gas emissions, waste and in water use. Concerns over meeting sustainability objectives have been greatly reduced, however, as more flooring manufacturers list environmental and health data for their products. “There’s a broad enough selection of products out there that meet sustain- ability requirements,” noted Peter Lepage, vice president, government sales division, CCA Government Floors & Interiors, Alexandria, Va.
of Alameda, designed by Noll & Tam Architects, features the timeless patterns from Patcraft’s Enflection and Enform carpet tiles. Case in point: New soft surfaces which exceed the GSA stain requirement are fiber-based products featuring inherent stain resistance — such as Solution Q Extreme fiber — while maintain- ing the texture requirements. “In addition to this high-performance option, innovations in primary backing, tufting and secondary backing have allowed soft surface manufacturers the ability to produce high-quality and high-performing products with less fiber,” noted Kieren Corcoran, marketing director, education and government, Patcraft. As government agencies strive to be good stewards of the public’s dollars, this can provide impactful savings. “For example, if there is a problem that cannot be resolved, one carpet tile can be replaced via a cost-effective, efficient shuffle strategy rather than cutting out and replacing a piece of broadloom, potentially creating a visual eyesore or larger replacement expense,” Patcraft’s Corcoran said.